What THAT is, my fellow homebrewers, is the National Homebrewers Conference. 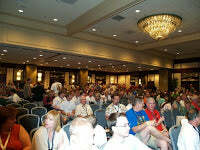 The NHC is pretty much what it sounds like: a conference dedicated to homebrewers like us. 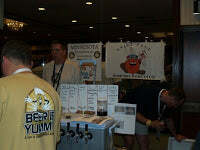 The NHC is put on by the American Homebrewers Association (AHA) and local organizers (read: homebrew clubs). The NHC changes location every year, and for those of you living in the Midwest, you are in luck! The 2010 NHC will be held in the Twin Cities in Minnesota from June 17th -19th. The NHC involves daily seminars/talks from industry professionals that cover topics such as sanitation, Brettanomyces, yeast banking, etc. Beer geek stuff that I know I enjoy. Each day concludes with a special event in the evening. Those special evening events are Pro Brewer's Night, Club Night and the Awards Banquet. Pro Brewer's night is like a mini beer festival with local and national breweries pouring beers. Club Night is where all the homebrew clubs break out their finest homebrew and dress in theme. The Awards Banquet (sponsored by Rogue!) is where we find out who won medals for their homebrews. Awards banquet? 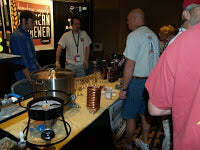 Yes, the the not-to-be forgotten portion of the National Homebrewers Conference is the National Homebrew Competition. This national competition has regional qualifying rounds and culminates in the final round occurring during the conference. This is the premiere homebrew competition in the nation. Kudos if you get a medal.